The winner of our May-2016 monthly draw for a $100 gift card is Dorothy Tam! Hi Dorothy, please visit SURA Korean BBQ Restaurant in Richmond Aberdeen Centre, between tomorrow June 17, 2016 and July 16, 2016, with your ID (a must!! ^^’) to claim your prize! 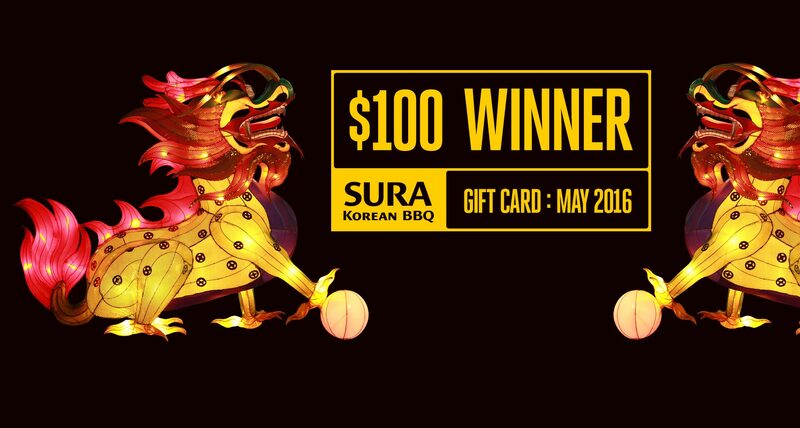 If you have any questions regarding this prize, please contact us simply at info@sura-koreanbbq.com or or via Facebook messenger!